The first ten minutes of math workshop are often my favorite part of the day. This is a time when we use number sense routines to build math understanding and also to build communities in which students are talking about and playing with math. We try to make this time a time when every single student feels a sense of belonging, efficacy and participation in the mathematical community. As our 5th graders have begun thinking about addition of fractions, we want students to learn more than procedures for fraction computation. We want them to reason about fractional equivalencies and relationships as they solve problems. 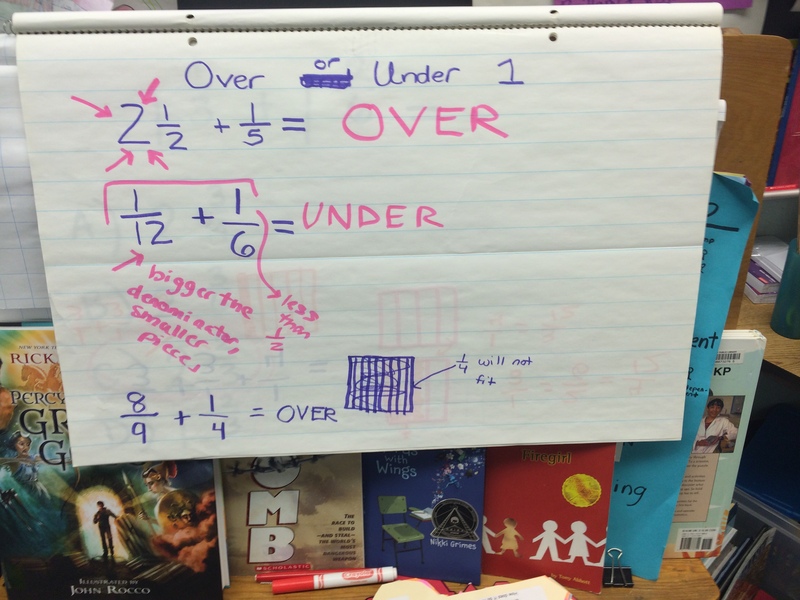 In this version of Over or Under, students are asked to consider whether the sum will be Over or Under 1. Students are presented problems one at a time (we usually did three problems each day). Students have time to think about each problem on their own. No one raises hands yet. We just think in silence (this takes practice!). Then we either have partners do a turn and talk or share ideas as a whole group. 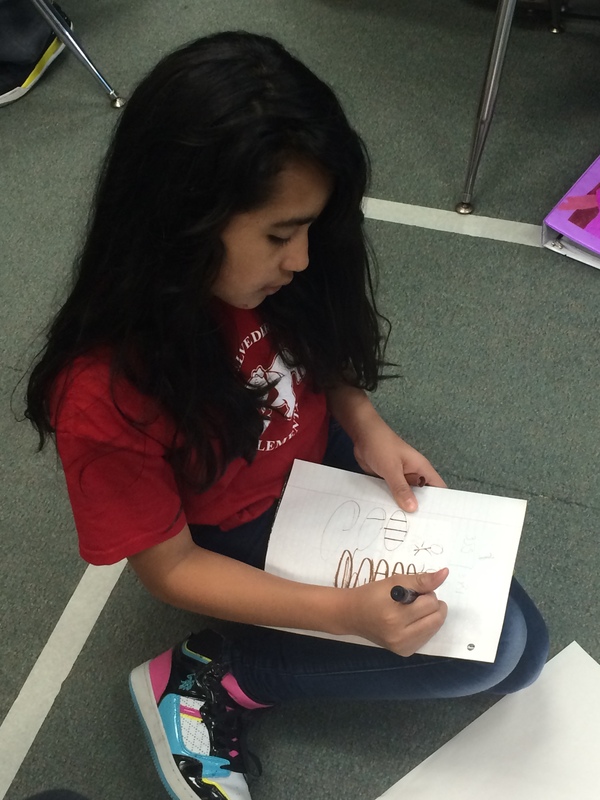 Finally, for one of the problems, we have students share their thinking through drawing and writing in their notebooks. We decided to start each day with a problem that would seem fairly easy to most students, but would open conversation up about an important idea. In this case we wanted students to think about mixed numbers and how the whole numbers can help us make reasonable estimates. This was my favorite question for eliciting fascinating student thinking. Many students talked about what an area model of 8/9 would look like and what the “missing piece” (1/9) would look like. Many said that 1/4 was too big to fit in this “missing piece” and thus the sum would be more than 1. Here are some of the other problems we used throughout the week. We recorded some student ideas as they talked, but we got so into the talk at times, we didn’t record everything. We did notice that students still need more experience thinking about linear models. This week we started playing the awesome Investigations game “Fraction Track” which encourages just this kind of thinking. I’ll be interested to see how experience with this game shifts some of their thinking and reasoning about fraction computation. Today students took a district-wide multiple choice assessment. One of the questions asked students to solve 4/5+1/3. Only one the answer choices was over one! Many of the students wrote that they didn’t need to solve the whole problem or worry about finding common denominators because they knew that 4/5 + 1/5=1 and since 1/3 >1/5, the sum would be more that 1. Boo ya! Way to outsmart a test question with reasoning and number sense, kids! Besides building number sense, this routine really built community. The game aspect of the routine (Is it over or under?!) really appealed to the kids. They loved arguing for their ideas. Also, not having to arrive at an exact answer was very inclusive of all students. Even students just developing strategies for addition of fractions were able to share their hunches. “I think it might be over because…” The risk of sharing this idea was low and students refined important ideas about fractions even around the “easy” problems. I’m looking forward to extending this routine into subtraction with fractions! How else would you use this routine? Previous Post Is There Room For Math That Isn’t Hard? You could up it a bit and ask if the answer to a particular problem is closer to 0, 1/2, 1, 1 1/2 or 2. Yes, that would be a great modification, Vince. I think the more students create that number line in their minds and understand the relationships between different fractions the stronger they get with their computation. Thank you for linking the district assessment to the Math Exchange work that is being done in the classroom. The teachers that I support express a lot of hesitation towards math exchanges. Their focus is directly teaching the concepts that are on the assessments. I will be sharing this blog for these teachers to ponder. Thanks, Amy. 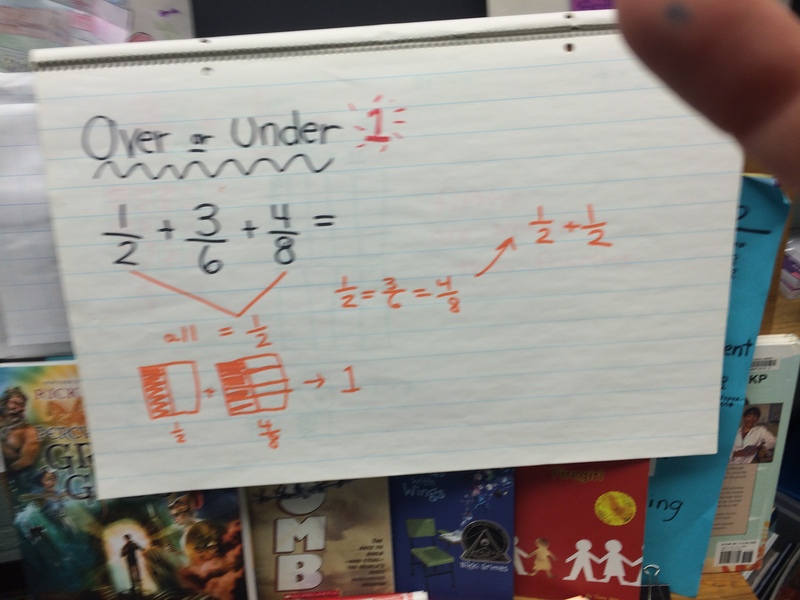 It always feels good to see kids applying their number sense to new situations–even testing situations! 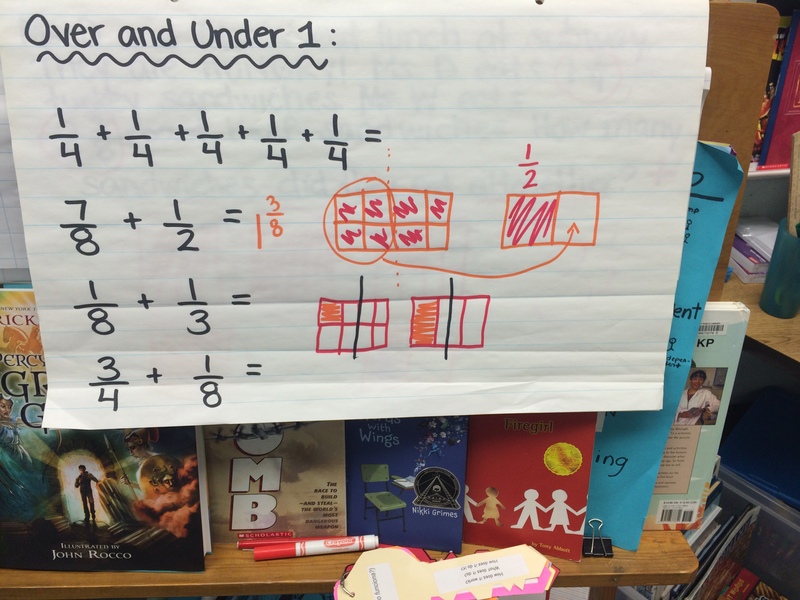 Love this framed as “Over or Under” – I will be using this idea in my fraction PD – thanks! One way you could connect this to a linear model is to use a number line with endpoints 0 and 2 on a strip of paper and a paperclip. Have students slide the paperclip along the number line to estimate the answer and justify their thinking. A lot of the same rationales that you shared with the area model will come out with the number line. I like that the students have the flexibility to revise their thinking once they partner share and can easily adjust the position of the paperclip.